Alaska's most recent deadly tsunami struck without warning on November 3, 1994. Witnesses described new steel sheet piles snapping in half as the railway dock, which was being refurbished, suddenly slid away from the shore. One man working under the dock somehow scrambled to safety. Another, Paul Wallin of Homer, was trapped underneath it and then killed by a speeding wall of water and debris. The undersea landslide was about 600 feet wide, at least 50 feet deep, and composed of anywhere from 1 to 3 million cubic yards of earth. It displaced enough water to generate 20-foot waves that heavily damaged Skagway's ferry terminal and clogged the small boat harbor with debris. Eight hundred feet of the railroad dock had disappeared. When we think about tsunamis, most often we imagine a large earthquake moving the seafloor vertically and generating huge, fast-moving waves that can threaten communities hundreds and even thousands of miles away. These are called tectonic tsunamis, and they are a major threat to coastal communities in Alaska. However, landslide-generated tsunamis can be even more dangerous to communities near where they occur. In fact, the largest tsunami ever, in terms of wave height, happened in Alaska in 1958 when a magnitude 7.8 earthquake sent a large rockfall crashing into Lituya Bay. Giant waves scoured the bay, killing five people and running up the opposite shore as high as 1,700 feet above sea level. Landslide tsunamis don't even need earthquakes to set them off. The Skagway slide started when an extreme low tide caused massive slope failure of glacial sediment deposited by the Skagway River. These two very different tsunamis--Skagway and Lituya Bay--demonstrate some of the characteristics that make landslide tsunamis so dangerous. They tend to strike with little or no warning. Even when an earthquake triggers the landslide, waves usually reach shore far more quickly than they would from a tectonic tsunami, sometimes even before the shaking stops. Finally, waves from landslide tsunamis usually are higher and run up farther than waves from tectonic tsunamis. Tsunamis generated by the 1964 Good Friday earthquake killed more people than the earthquake itself, and over two-thirds of those deaths were caused by landslide tsunamis. To prepare our recently completed tsunami hazard assessment for Skagway, we numerically modeled potential tsunamis generated by local landslides and earthquakes in the Gulf of Alaska. In figure 2, the red and black lines show the extent of the tsunami inundation from these sources, and the color coding shows potential water depth over previously dry land. The results demonstrate that the tsunami hazard in Skagway is greater from underwater slides than from earthquakes. Landslide tsunamis threaten coastal communities throughout Alaska, but they are of special concern in Southeast Alaska. At the heads of Southeast fjords, glacial streams rapidly deposit sediments and form deltas that easily lose strength during earthquakes or extreme low tides. Slides can occur immediately during an earthquake or can happen after shaking stops due to creep or other factors leading to slope failure. The common elements are a mass of unconsolidated material on a steep slope and conditions that will eventually cause it to slide. These can be found throughout Southeast, and often very near to places where people live, work, and play. If you live in a community at risk from landslide tsunamis, you need to know what to do when you feel a powerful earthquake because there may not be time to wait for an official warning. 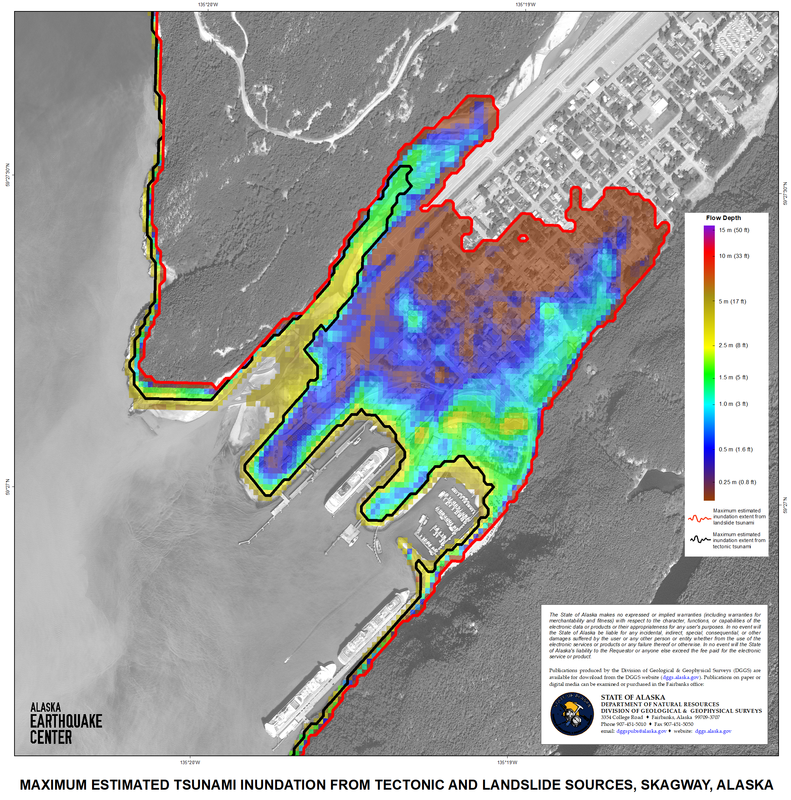 All of our tsunami inundation maps and reports, produced in cooperation with the Alaska Division of Geological and Geophysical Surveys, are available here. Please review the maps for your community, talk to your local officials, and make sure that you and your family know where and when to evacuate, on your own initiative. Site of the 1994 Skagway tsunami. Glacial rivers leave deep sedimentary deposits at the heads of steep-walled bays and inlets, setting the stage for dangerous landslide tsunamis. 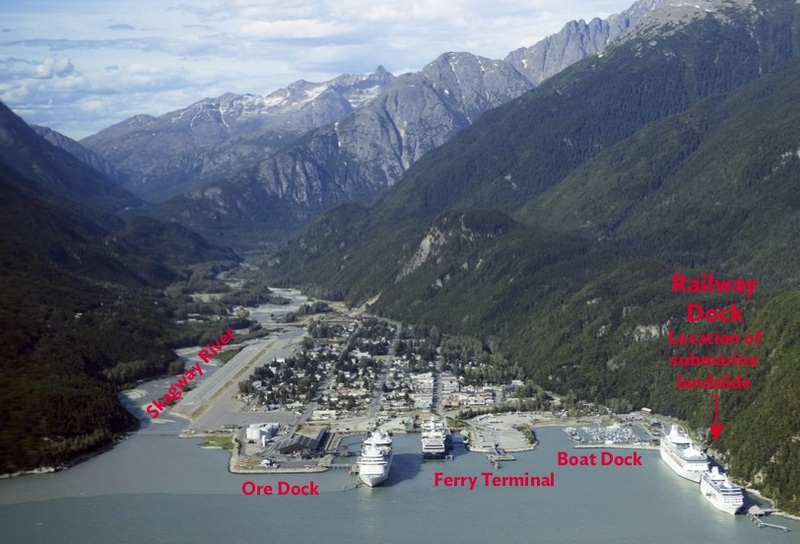 What could happen to Skagway in different tsunami scenarios. The red line marks possible inundation from a landslide tsunami, which is far more extensive than from a tectonic tsunami (black line). The full report and detailed maps for Skagway will be available later this summer.